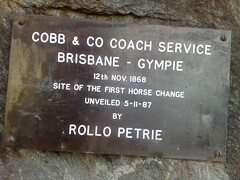 Cobb & Co operated a horse -drawn coach service between Brisbane and Gympie in the nineteenth century. The coaches would stop at “Murrumba” – Tom Petrie’s homestead (now at the top of Armstrong Street, Petrie). At Murrumba, they’d change the horses, freshen up, and continue the journey to Gympie along what today is known as “Old Gympie Road”. 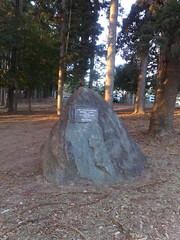 Nothing remains of the homestead, but Tom’s grandson, Rollo, unveiled this memorial to the coach stop in 1987. This is a beautiful spot. 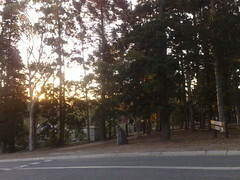 If you’re ever in Petrie and have a spare ten minutes, walk to the top of Armstrong Street in the grounds of the Catholic Church and Schools. If you’re still, you’ll hear the hoof-beats of the Cobb & Co coach coming up the road.